States' Fiscal Future Starts To Look A Bit Brighter The improved outlook comes at a painful cost: nearly 700,000 state and local government jobs lost, and significant cuts to education and other programs. And since a quarter of states' budgets come from federal funding, more problems are on the way. But the hope is that the days of crippling budget deficits are at an end. 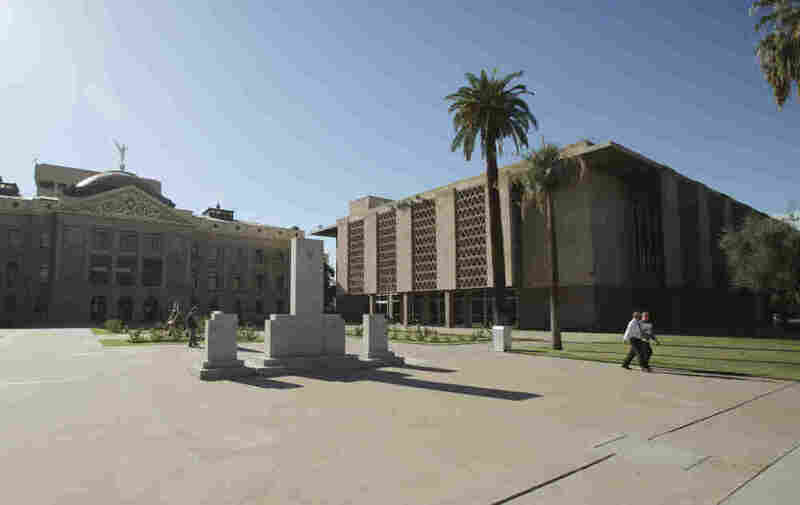 In 2010, Arizona sold 22 buildings in its state capitol complex to help deal with budget deficits. Gov. Jan Brewer recently asked representatives to buy back three of the buildings, including the State House of Representatives (right), as the state's financial situation has improved. The Old Arizona Capitol Building (left) was not part of the deal. As the U.S. economy struggled to get back on its feet over the past few years, a lot of states found themselves contending with big budget deficits. They responded by firing workers, raising taxes and cutting spending. Now the fiscal picture for a lot of states is brightening a bit — but many still face enormous challenges. Arizona, for example, was hit hard by the real estate meltdown. At the height of the recession the state's finances got so weak that Arizona leaders took an unprecedented step: They sold off most of the buildings in the capitol complex, then leased them back. This year, in her State of the State address, Republican Gov. Jan Brewer told legislators it was time to buy the buildings back. State governments as a whole were bringing in more money than they were spending for a few years leading up to the financial crisis of 2008. After that, revenue dropped millions below spending, prompting big cuts to education, health care and law enforcement. "I'm asking that you send me a bill by Statehood Day that allows me to buy back the capitol complex," Brewer said, "and together we can celebrate the burning of that mortgage." Brewer says Arizona can afford to buy the buildings back because its fiscal picture has stabilized. Sue Urahn, with the Pew Center on the States, says that after struggling for years with huge budget deficits, many states are seeing light at the end of the tunnel. "We are seeing improvements — meaningful improvements — on the revenue side and states have cut costs significantly, so the fiscal situation is better in many cases," Urahn says. Of course, states like California and New York still have sizable deficits to plug. And states have achieved their new fiscal balance at a painful cost: Nearly 700,000 state and local government jobs have been lost since the recession. There have also been big cuts in spending for education, health care and law enforcement, notes Nick Johnson of the Center on Budget and Policy Priorities. "Some of the things that states are doing ... once would have been kind of unimaginable," he says. "The depth of cuts in funding for K-12 education, for instance, [has] been very significant and I think a lot of governors are recognizing it." In states like Idaho and Virginia, Republican governors are calling for increases in funding for schools. Last year Florida Gov. Rick Scott tried to push through a corporate tax cut. This year, he wants $1 billion in new education spending. Scott says Florida may have nice weather and great beaches, "but if Florida doesn't provide the intellectual talent to make our businesses competitive, we will become a footnote when this century's history is written." The depth of cuts in funding for K-12 education ... [has] been very significant and I think a lot of governors are recognizing it. Nick Johnson, of the Center on Budget and Policy Priorities. Florida can afford to spend more money on education because its high unemployment rate has ticked down. Urahn with the Pew Center says that as local economies improve, state tax revenues tend to increase. But she warns that most states aren't out of the woods yet. "On average, states are still 6 percent below the amount of revenue that they were bringing in before the recession," Urahn says. "So yes, things are improving, but they're still at a considerably lower level than they have been for several years." And there are big challenges looming. States get a quarter of their revenues from the federal government, which has budget problems of its own. After the debt ceiling standoff last year, Congress formed a committee to try to reduce the deficit. But it was unable to agree on a plan, triggering automatic spending cuts. Johnson, of the Center on Budget and Policy Priorities, says that will hurt states. "The federal government is scheduled to make another round of very deep budget cuts in January of 2013. If those were to go forward, a very large chunk of those would directly hit state budgets in the form of cuts in grant programs," he says. And because states pass a lot of money on to county and local governments, the federal cuts are likely to be felt throughout the economy. The hope is that the U.S. economy continues to improve and that the days of crippling budget deficits are at an end.